To this end, our products are able to store as much energy as the best lead acid batteries - while fully charging in just minutes and doing it up to 100,000 times. They’re also much safer than their temperature-sensitive battery counterparts; and, will save you a great deal of cash over their lifetime of ownership. With patent protection in place and dozens of satisfied customers already, we’re powering up towards an energy storage revolution! There’s nothing quite like unwrapping a new smartphone for the first time - lots of buttons to explore, a scratch-free screen, and a battery that actually lasts longer than a few hours. But as anyone can attest to, this long battery life quickly fades into an endless cycle of dead phones and excessive charge times. And that’s certainly not to say the demand for higher energy and power isn’t there; quite simply, we’re just lacking a good solution. In contrast to battery innovations, supercapacitors have carved out a place in the market by delivering much higher power - but cancel this out with low energy. So, a clear need remains for supercapacitors that can actually store more energy - especially in applications that require more than 1,000 cycles. This brings about a great opportunity for a new innovator to access a wider range of applications and gain significant share in the $7 billion lead acid battery market. 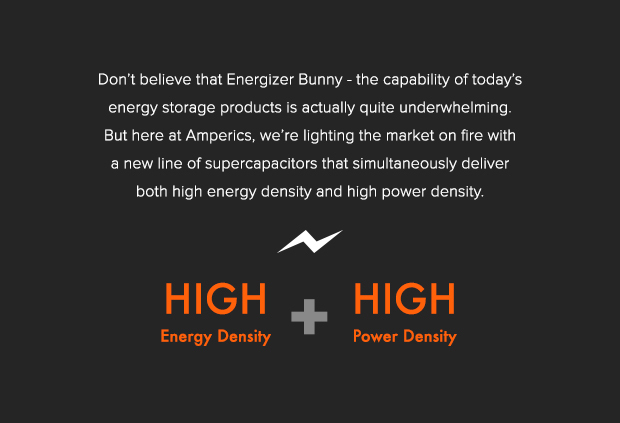 At Amperics, we’re fully aware of this opportunity - and are stepping up in a big way to lead the market to new heights. It all starts with our ability to increase standard supercapacitor capacity to equal that of a lead acid battery. 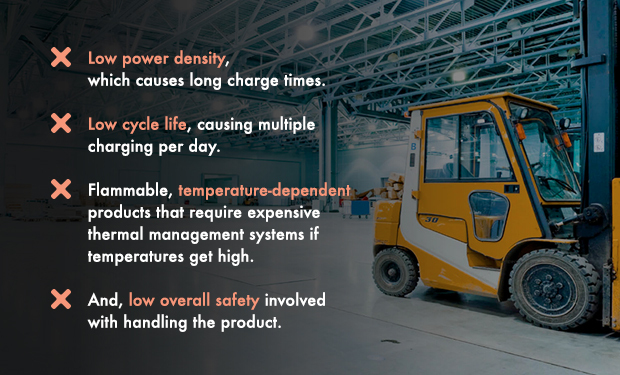 As a result, unlike any other product on the market, ours actually satisfy requirements for high energy density with the ability to charge and discharge rapidly - with a long cycle life that’s also safe. 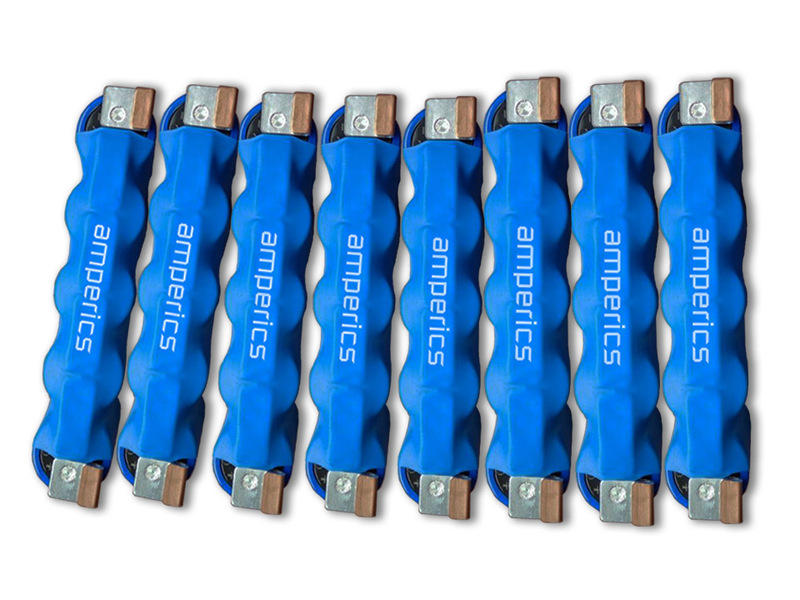 The Amperics product line combines the best aspects of supercapacitors and batteries into a asymmetric device. This means that high energy storage has finally met its perfect partner in high power delivery - and the result is full charges in minutes that are good for more than 50,000 to 100,000 cycles. What’s more, in terms of both cost and total cost of ownership, our products are also less expensive than any competing solution on the market. 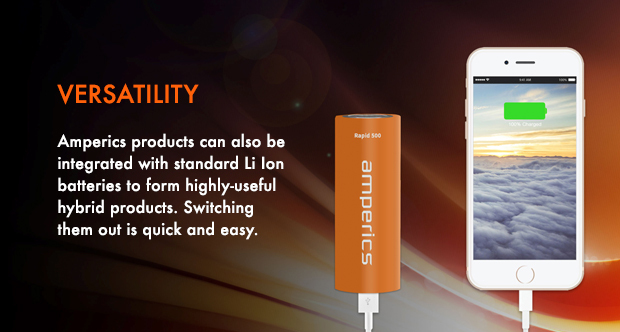 Best of both worlds – At long last, rapid recharge, long charge life, a materially infinite cycle life, and high power are offered in one singular energy package with Amperics – without needing to change the common supercapacitor model. Highest energy density – We've found a way to up supercapacitor energy density by 5x, reaching the lead acid battery range. This makes our products ideal for large applications. Better performance, lower cost – Despite this awesome performance, we were still able to simultaneously lower costs and our customers' total cost of ownership. The use of inexpensive raw materials like C-Carbon and metal oxides through our proprietary process allows for this. Temperature safety – Li Ion batteries are unsafe to the point where it can explode at over 40 degrees centigrade. Our lead acid replacements are safe, clean, and have a much wider temperature tolerance. Environmentally conscious – Our products boast a greener build and design than other products on the market while still maintaining equivalent energy storage. More space – Using our much smaller products will free up a great deal of storage space in your facilities that used to be occupied by bulky lead acid batteries. The phenomenon of pseudocapacitance – on which we are based – was first demonstrated by a UCLA professor back in 2007. It was from this breakthrough where Amperics got its start; later, our CEO would partner with the Energy Research Institute at NTU in Singapore to complete development of our core technology. Upon setting up a pilot line was set up in Livermore, California, we would round out our executive team to form a trio of highly skilled scientists and engineers. Let's meet them! Bala's been leading the way here at Amperics since March 2011. After spending his first decade conducting deep chemistry research, he would then move into the corporate world – including serving as COO of $200 million solar module manufacturer Solar Semiconductor. He's founded successful solar startups, held other CEO roles, and was also a venture partner at XSeed Capital, an early-stage venture capital firm where he focused on materials and clean technology deals. This elite-level experience as a top executive, in addition to his tech expertise and startup chops, make him the ideal person to call shots as our CEO. 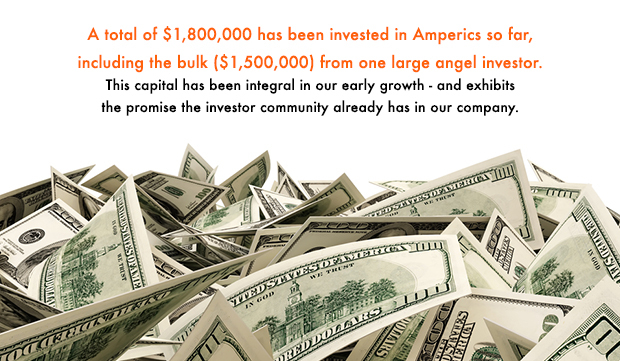 Want to learn more about Amperics and how we’re creating shareholder value? Make sure to request access to the Business Plan tab of this profile to find out how you can get involved! Products launched and ramping to volume. 2018 marked a long awaited milestone: With products launched and the market channels and supply chains in place product has been shipped to over 250 customers through the Amazon and the Amperics website. Customers are rolling in. Marketing through the Amperics website and Amazon Amperics has shipped product to well over 250 customers and continues to do steadily. Additionally, Amperics engages with large customers directly and had MOU's & LOI's with mutiple customers for a revenue opportunity in excess $5M. Supply chain in working order. Our Livermore-based pilot plant is the lynchpin of all operations, from development, to roll-to-roll processing. On the manufacturing end, we’re contracted out with Chengdu, China-based Z-Tech - who is constantly within an arm’s length. Key IP protection secured. One issued and two provisional patents are in our portfolio, providing us with valuable protection against competitive attacks. Together, they describe our electrolyte systems’ matter composition, the manufacturing process, and design. Armed with this early volume , we’re extremely confident about what the future holds. For us, this future is all about product development. Current product offering is focused on 12V and 24V modules. Near term efforts will be focused on enhancing the current offering of supercapacitor modules – specifically targeting stock engine & diesel generator set starting applications and lift gate applications. 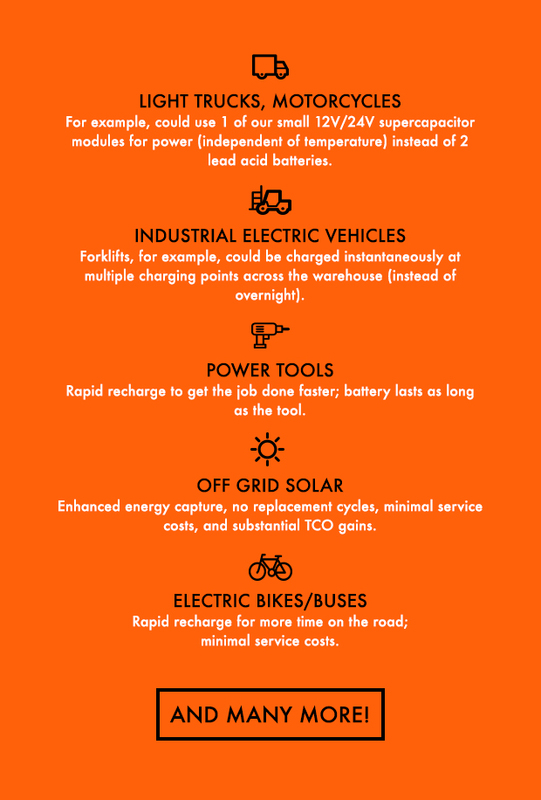 Our plan is to make modules that can be dropped in so that customers won’t have to build into/design their own systems to replace lead acid batteries. These enchanced products current come in both 12V and 24V versions with volume release coming in May or June of this year. Amperics has a strategic corporate investor and partner in Adomani Inc. as move into the urban transport vertical is accelerated.